When it comes to the facts about vitamins, the truth is that they are crucial to maintaining your body’s vitality, functioning, and overall health. But it’s also true that vitamins are especially important to your health when you are trying to lose weight. The reason it’s important to know the facts about vitamins when you go to start a new diet is that your body is especially vulnerable during this time. When you put your body through the surprise stress of changing your diet and engaging in more physical activities, your body has to work harder to keep up with all of the new demands put on it. If it doesn’t have all of the nutrients it needs to do this, it’s possible to become ill and your body could begin breaking down good tissues like muscle and bone in order to make up for the unmet needs and that’s not something you want to have happen at any time, let alone when you are trying to lose weight! This means that getting all of the vitamins and nutrients that you need can be a critical factor in whether or not you reach your weight loss goals. So what are the need-to-know facts about vitamins? It’s important to know that taking one multi-vitamin may not be enough, nor is it necessarily the best idea in the first place. The problem with taking a multi-vitamin that is supposed to contain a whole bunch of everything is that you may not be paying attention to what’s missing or to what you may be getting too much of already from your normal diet or another supplement. Many people take several vitamins thinking that there can’t be too much of a good thing, but the truth is that you can overdose on vitamins with potentially negative health consequences. You may have read about the recent scare about the dangers of vitamin E and the facts about vitamins overdoses, but in reality, overdosing on vitamins is rare, but possible with certain vitamins. 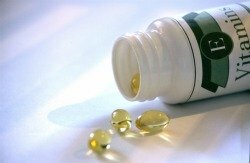 Most vitamins are water soluble, which means that your kidneys will excrete any extra amount that it doesn’t use every day – this is another reason why it doesn’t make sense to aim for any more than 100% of what your body needs.Other vitamins are fat soluble, which means that any extra you eat will be stored in your body where it can potentially build up to toxic levels. Vitamin C is an example of a water soluble vitamin that your body will use as it needs it and get rid of the rest. This may be surprising for some people who are used to taking mega doses of Vitamin C to protect against colds and the flu, especially given the way every product seems to market the importance of Vitamin C. The facts about vitamins mega-dosing say that your body probably won’t use it all, so don’t get caught up in all of the hype. Aim to only get 100-200% daily value for vitamins and minerals by checking the nutrition panels on foods you normally eat and selecting individual supplements that your diet is lacking or adding foods that are rich in those vitamins you need. Be extra sure to check your breakfast cereals, bread, and milk products which tend to be fortified with lots of extra vitamins. They are also an excellent alternative to tablet supplements. Either way, pay attention to the vitamins that you are getting in your diet to ensure weight loss and overall health success.